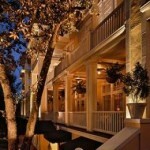 The Partridge Inn was built in 1836 as a private home, and has had a long history of conversions and renovations. 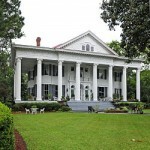 Currently “The Grand Hotel of the Classic South,” the inn boasts, along with its other Southern charms, a ghostly bride. Wearing an 1800s wedding dress, she is said to have died of a broken heart here when her fiance was killed. Her name is Emily, so don’t forget to say “hello” if you meet her. Several times throughout the night of my recent stay I heard footsteps walking around on the ceiling above me….. I was on the top floor. I deli rr6 groceries to the kitchen here and every time I stop here I feel like I’m being watched. It’s to the point that the hair on my arms stand up. Berry uncomfortable feeling. Never physically seen anything though. I had the pleasure of working at The Partridge Inn from 1997-1999 as an administrative assistant to the Innkeeper Joel Sobel, and wife Jeri. My office was located in the original part of the house, the ceiling was only 7ft high and 3 file cabinets sat on the flat hearth of a very old fireplace. I never experienced any strange occurrences but the hotel is absolutely beautiful, the history is rich and the walls hold old photos of from many many decades ago. The hotel was built across from The Bon-Air Hotel which was built for ,rich Northerners who came to the south during their extremely cold winters. Soon after US Presidents were visiting. They preceded to purchase large homes in the area, which is known as the Summerville section of Augusta. LOL, guess this is more info than you really needed. Thank u so much Judy Loveday. I was delighted to read your comment since I’ve always loved learning the history of things/places/people, ESPECIALLY the history of Augusta GA. I was born and raised here and I’ve lived in some pretty old houses that hold their own history mysteries which excited me to research and discover. Your post was fabulously informative and knowledgeable and I thank u sincerely.